Home > 2014 > 06/27 > Jared McCann: Bergeron 2.0? 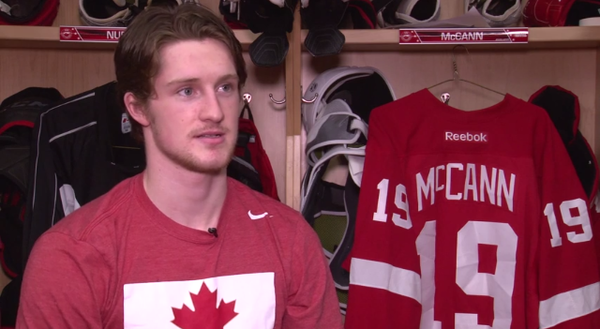 Ok, Bergeron 2.0 is a pretty unfair question to ask, but you can blame Jared McCann for that. His gifted offensive talents combined with the pride he takes in shutting the opposition down could make him a name that comes up in Selke talk in the future. I was fortunate enough to talk to the projected mid-to-late first-rounder about his game, his development, and learning both ends of the ice. Warning: May also contain totally sweet highlight reel video. No, well, yeah, I guess so. who I model my game after anymore. Who are the guys that you model your game after now? Patrice Bergeron or Jonathan Toews. Ha. Hopefully! It would be nice. little more recently – your two-way game. How do you think that has developed? next level. I feel like I’ve been improving and going in the right direction. Tolchinsky – you were able to create magic out there. with Fritsch for a bit and Tolchinsky, but just playing in the Soo was amazing. felt like it was the best place for me to be. I was an LA fan when I was younger. just be doing that, too. No, no. I have photos to prove it. What about your favourite King? Right now it’s Jeff Carter and then back then… I don’t know. Good question. Wayne Gretzky, probably. Wayne Gretzky is not a bad player. Haha well he’s a Soo Greyhound, so. you see yourself buying with your first pro hockey paycheck? What are some of the things going through your head right now? You’re hours away from being drafted into the National Hockey League. I guess I’m nervous. I didn’t really sleep that well but it is what it is and hopefully when I hear my name called it’s going to be a great experience with my family. It’ll be a dream come true. the coaches go to be a difference. if you had scored a goal? against them and really making it hard on them. A goal prevented is as good as a goal scored. Keep it coming with the mid to late round draft profiles. It’s nice to have a story attached to the names that will get called tonight. Damn then the goalies are good for 30 goals a game prevented. They better than the goal scorers. I was speaking more at the team level; McCann gets it that as a team preventing goals matters just as much as a team scoring. But there’s a reason goalies win the Conn Smythe so often; it’s the one position where you can flat out steal a game (or series) by preventing scoring. I want to see at least 10 more of these articles before 5pm when the draft starts. Calling anyone the ‘next Bergeron’ is a bit of a stretch. Bergeron is an incredible anomaly, in that he had a relatively average junior career, and turned into a stud on the NHL level. That’s unlikely to happen to anyone. Refreshing to hear from a young player with a really mature view of the game and what he can bring to it. Should be interesting to see where he ends up going. Two-way games are interesting. You can be praised for it by some (McCann here) or ripped for it (Gauthier last year). More offense here at the moment, but still he’s where he is in rankings because of that defensive game. Good interview though. Should be a helpful piece for whoever he ends up with. Probably fine to say Bergeron 2.0 since people are always looking for those guys, like the Lucic 2.0, or the Pronger 2.0, etc. His locker is right beside Nurses’. Even if he ends up like a Colin Fraser type. Fraser has 3 Stanley Cup rings to his credit, if he were to retire today. What is the purpose of this interview on ON as the Oil doesn’t have a draft choice between the 3rd and 90th selection? With all that is going on Philadelphia right now surely there is more notable news to share? Funny that Kopitar isn’t his favourite King. He mentioned Carter as a former Greyhound. That jersey with the # 19…I’d say he’s a closet Yzerman fan. canucks.com… ducks site AND NHL.com STILL don’t have the trade up on their sites…it’s just YOU and the Globe & Mail…way to go SCOOP!! !